England enjoyed a resounding victory over New Zealand in the first Twenty20 international at Eden Park in Auckland. 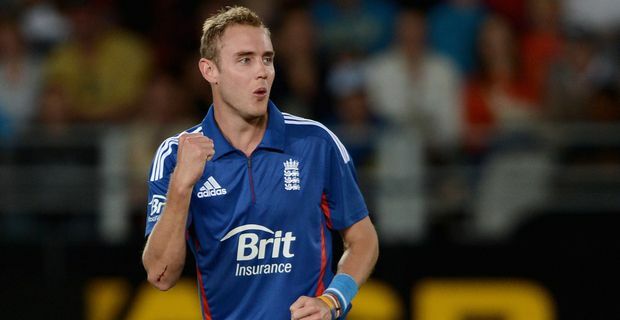 Captain Stuart Broad celebrated a winning return to the side after injury problems, taking four wickets for 20 runs. The Auckland ground was ideal for batting, with short boundaries encouraging the big hitters. England, put in to bat by the hosts, were aggressive throughout, with Eoin Morgan and Luke Wright particularly impressive with their accumulation of boundaries and Johnny Bairstow and Jos Buttler joining a middle-order party scoring at over two runs a ball. England amassed their highest-ever Twenty20 total of 214. England scented victory early in the New Zealand innings when an excellent catch by Morgan dismissed the hosts' danger man Brendon McCullum, ranked as the best Twenty20 batsman in the world. Without him, New Zealand had little chance of maintaining the daunting run rate needed to overhaul England and fell 40 runs short, a substantial margin in Twenty20. Broad’s wickets meant he overtook Graeme Swann as England’s most successful bowler in this format. The captain was more interested in the team performance, which he admitted was the best under his captaincy. "Looking back to the 2010 World Cup, where we won, we were fantastic throughout that tournament," he said, "but to go and get a record score of 214, that’s the exciting thing in this team, to have that mindset to go and get such a high score and defend it comprehensively. We’re delighted with that." There was an awkward moment right at the end when Jade Dernbach bowled a beamer at Mitchell McClenaghan. The bowler apologised immediately and, to his credit, McClenaghan did not make an issue out of the incident. The teams move on to Hamilton for the second match in the three-match series. "We’ll have to be right on the money again," Broad added.